Freud described changes in the structure of the mind, including the consolidation of the superego with resolution of the oedipal complex. Important psychoanalytic thinkers since Freud have studied and emphasized the role of pre-oedipal development in the creation of psychological structure. While each of these authors developed his or her own language and concepts, they all described a fundamental transition in the structure and working of the mind that has profound importance for the psychological functioning of the child and the adult she later becomes. This book closely examines the analyses of two little girls. One began analysis having already achieved the transition to a more enduring and reliable psychic structure, a cohesive self. Because she had several experiences that overwhelmed her emotional capacities prior to entering the oedipal phase of development, her oedipal experience was filled with anxiety and overstimulation. At the start of her analysis , the second child contended with anxiety about loss of the object and abandonment, and she struggled with the process of separation/individuation. Her psychic structure, her self, was not cohesive, and she was vulnerable to fragmentation. During her analysis, her stymied development was freed up, and the authors trace the changes within her as psychic structure consolidated and oedipal material took center stage. Comparison of these two young girls and their analyses enables the authors to illustrate and describe important mental phenomena and psychoanalytic concepts. These include psychic structure, the self, the similarities and differences between a mind that is vulnerable to fragmentation and one that is not, and the internal states associated with fragmentation and trauma. 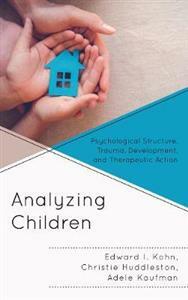 By looking into the differences (and similarities) in the ways each girl responded to interventions by her analyst, the authors explore psychoanalytic technique and therapeutic action, including the many manifestations of interpretation and insight, the role of the analyst as a developmental object, and the development of psychic structure. The authors show how similar manifest behavior and content have different latent meanings and sources for each child, and they further illustrate the transformations of fantasies, anxieties, preoccupations, and ego structures over the course of their analyses.